Just a quick hello from Me, the Diva! I hope you're all having a great summer - i can't believe it's over halfway over for these kiddos and that in a month they'll both be back in school. Yesterday was a Civic Holiday in Canada - Saskatchewan Day here where i am, and so in true Diva fashion the post was a day late. So, Happy Tuesday everyone! inexplicablysaw fit to trust me to be a guest Zentangle Diva while she spends quality family time this summer. 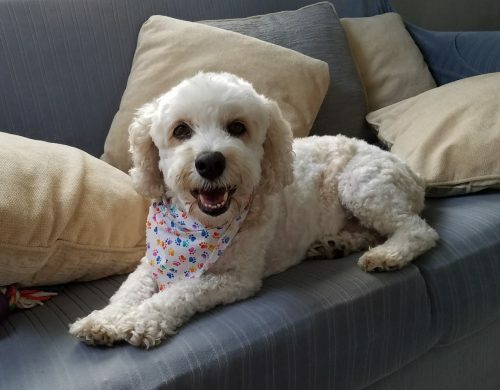 Neither of our 30-something sons are looking to spend quality time with the 'rents this summer, and our 12 year old dog is low maintenance at this point, giving me plenty of time to devote to this week's challenge. August?!? How did that happen? today is Use My Tangle (UMT) day. I've decided to go with Aloha, a tangle Linda Farmer used on Tanglepatterns.com, because I'm insecure and that validated it enough that it's been pinned over 1,000 times on Pinterest! OTOH, maybe some of you are already familiar with it and the thought of using it again (yawn) is making you want to go take a nap (like Dino is). 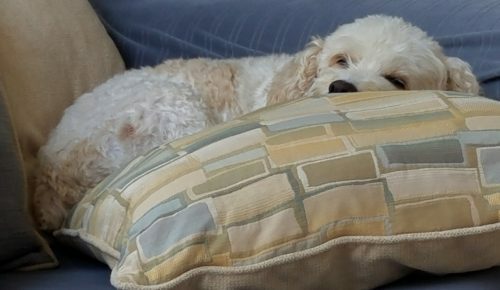 Does anyone else ever worry that they're too boring for their dog? Linda referred to Aloha as an "organic" tangle. She purposely chose to publish it on Earth Day which also ended up being a nice birthday present for me although I was born long before there was an "official" Earth Day. Why "Aloha"? I chose a Hawaiian reference because the tangle is inspired by a pattern I saw during a visit to Hawaii. Until then I was giving my tangles numeric designations and that unimaginative construct was definitely getting old. You can find the step outs and my inspiration for Aloha here. 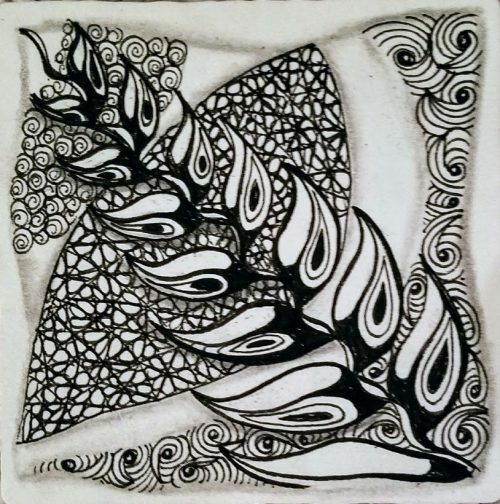 Using Aloha on an "official" tile, using the Zentangle method. Finally, here it is used in a more representational presentation with the tangle Henna Drum by Jane MacKugler, CZT. For today's challenge, use Aloha in any way you wish. It can be used as a border too. You can use it as a monotangle or with other tangles. I enjoy both your humor and your tiles, Suzanne. Looking forward to trying aloha. Thanks for guest blogging and for the challenge. For some reason, Blogger isn't letting me respond to any comment. (Maybe only real Diva's (not pretend guest Divas) can do that. In any case, thank you all for your kind words. I'm glad you like Aloha. Trudi, I was able to see your lovely response to the Aloha UMT challenge, but not able to leave a comment there. I really like what you did with it. Lots of movement. What fun to see you here posting, Suzanne! Aloha will be fun to play with. Good to 'see' you here Suzanne! I like that tangle you want us to use and will work with it later. Thanks for this challenge! Thank you for hosting this week Suzanne. We had a family art day, we all practiced. Have a great day. I love your tiles so beautiful. Thanks so much for the great challenge Suzanne! I've loved "Aloha" since it was first published on tanglepatterns.com. It's such a treat to re-visit it. Thank you for a wonderful challenge with your beautiful tangle Aloha. I didn't use that pattern very mutch but that is going to change definitely. I'm fond of Aloha, as a monotangle and in combination with other patterns. What a cute dog, lovely pics Suzanne. Thank you for your kind comments, Ria. I have added my version of your tangle, Suzanne to my blog page. Mine is a little different. I made Aloha tranZending over Swarm(only for background). 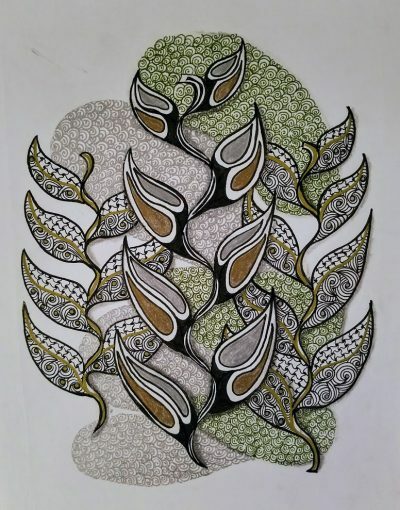 From one Boomer to another, here we all are invading..."Boomers in Zentangle". Duane, thank you for participating in my Aloha challenge. I have already visited your blog page and left my comment there. 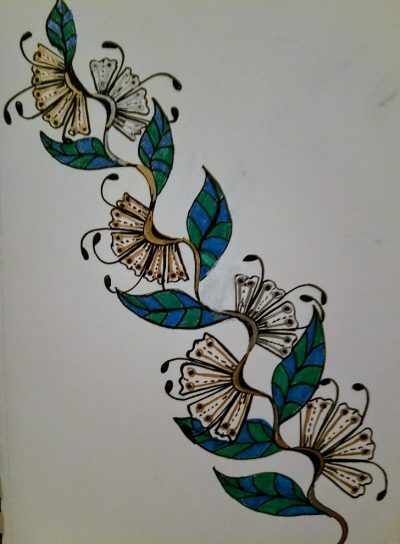 There are definitely more than a few Boomer Zentangle people----including Maria and Rick at the Mother Ship. I haven´t tried Aloha before. It is a beautiful tangle! So I made a monotangle of it. It was my first round but I imagine there will come more! What a cute little dog Dino is! Send him my hugs! Nice challenge. I like the organic nature of it and may explore a litte more based on your picture of your inspiration. Congratulations on having the opportunity to be a guest blogger. Thank you and thanks to Laura for letting me be a substitute Diva. Suzanne, thank you for being the guest blogger this week. How fun this one is. I love Aloha and hope I did it justice. By the way, your little dog Dino is sooooooo cute. :-D From yet another Boomer ('48). Dino and I thank you. You have a wonderful blog! Thanks for what you a doing and sharing. I have noticed for myself different tips and want to achive them in my life. If you want to make your educational blog more interesting ask for a help to buy review and you willenjoy the result!